You don’t need to be a Boy Scout or a parent of one to agree their motto “Be Prepared” just makes sense. Emergencies don’t follow a schedule. They happen whenever and wherever. 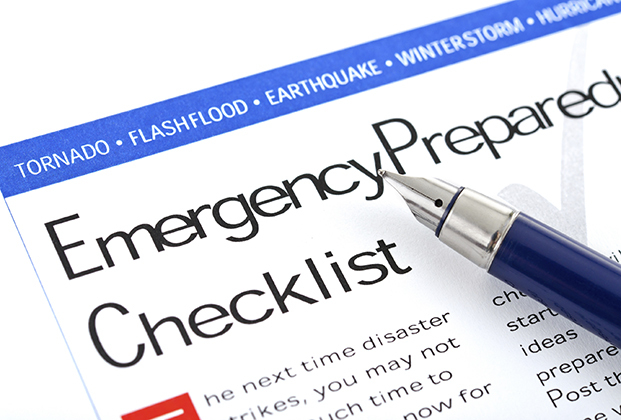 The real question is how well you will handle an emergency when it happens and how well you’ll be prepared. Whether the emergency is a natural or man-made disaster, there are steps you can take ahead of time to be ready for anything. Natural disasters often (but not always) come with some warning. Floods, tornadoes, and hurricanes are often predicted in advance, giving you a little time to get ready. Don’t ever think, “It can’t happen here.” For instance, no state in the continental U.S. has avoided a tornado. Flooding can happen anywhere there is a water source, and that little stream near your house can become a raging river under the right conditions. And while you might not live along the coast and be in the direct path of a hurricane, you could suffer the heavy rains and strong winds of these far-reaching systems. But what about the potential for sudden emergencies, the ones that happen in a split second and can quickly turn life upside down. Things like house fires, power outages, or medical emergencies usually don’t come with a warning and you often have little time to react. But how you react can be the difference between a total disaster or a simple disruption. So be prepared. Heed the warnings! Listen to updates on the TV, radio, social media or other media outlets. If you’re advised to evacuate an area in advance of a storm, do it. Don’t make rescue personnel risk their lives for your stubbornness to leave. Seek shelter immediately or go to a designated emergency shelter in your community, depending on the potential danger. Avoid low-lying areas near water sources during storms that cause flooding. Never drive through standing water, no matter how dependable you think your vehicle is. The evening news is filled with footage of stranded motorists who were sure they could make it across the flooded roadway being rescued from high water. Keep an emergency kit in your vehicle and stock it with a flashlight, batteries, blanket, bottled water, and snack bars. Remember, roadway emergencies can happen year-round, whether a summer thunderstorm or a winter blizzard. Be sure to keep a cell phone charger in your car at all times. When bad weather hits, go indoors or seek shelter immediately. Use common sense. Wanting to finish mowing the grass during the lightning storm, before the rain hits, probably isn’t a good idea. Make sure your home or apartment has working smoke alarms with fresh batteries. Have an escape plan in case you have to evacuate in the middle of the night. Make sure everyone in the house knows the plan, especially children, and practice the drill. You’ll be glad you were prepared if the smoke alarms blare at 2 a.m. Learn CPR, the Heimlich maneuver, and other basic first aid. You never know when someone at the picnic might choke on a hot dog. Going out for a hike or a day trip in the car? Make sure you pack water, snacks, and the right clothing, whether it’s summer or winter. Too often hikers or motorists encounter sudden inclement weather and are unprepared. Know where you’re headed, the forecast, and be ready for it. Always have a working flashlight with fresh batteries and candles available for those unexpected power outages. Common sense is one of the most important tools in your emergency prep kit. Don’t take unnecessary risks. Think ahead. Know what to do and do it. Being prepared is something you can count on when every second counts.